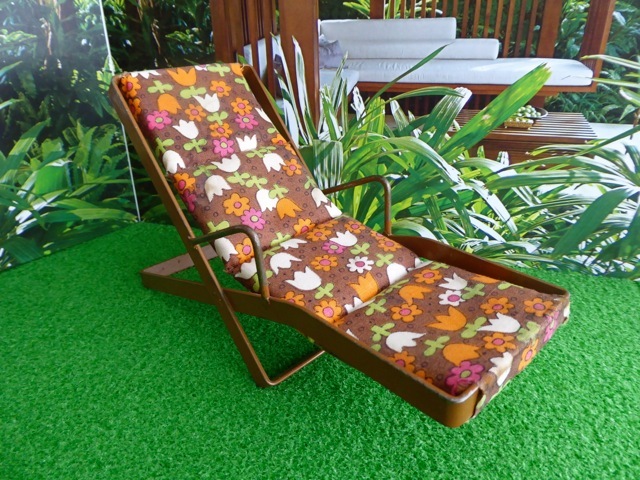 Furniture: Wonderful, reclining metal chairs with terrific retro-printed fabric on the soft cushions. We believe these chairs are French probably dating from the 1960's or 1970's and as with many vintage items over fifty years old, there is some paint loss on each chair – but this does not detract from the stunning stylishness of the set. Table: Vintage table painted to match the chairs, with a slick, geometric-patterned top. 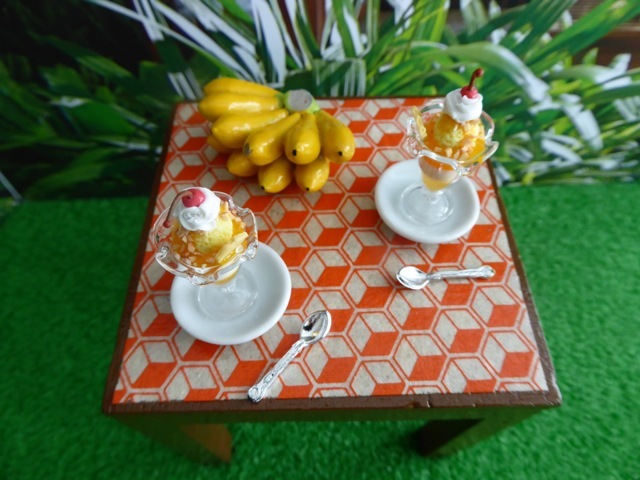 The table is set with two ice cream sundaes in glass dishes, which are set on two white ceramic plates, accompanied by two silvery spoons. There's also a bunch of hand-crafted yellow bananas for a healthier dolly snack. 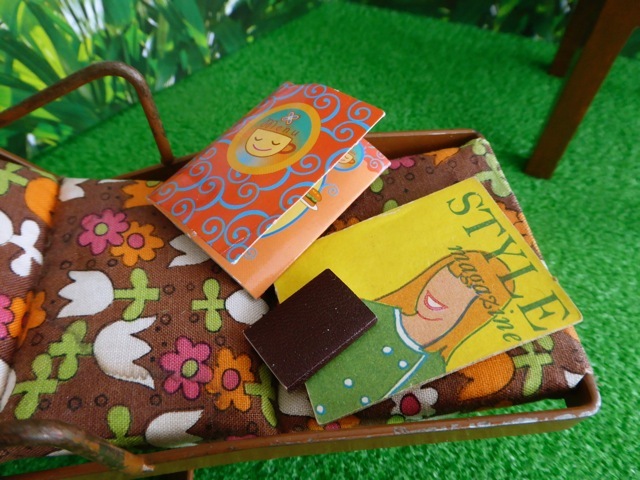 Magazines: Two little booklets and a blank book accompany this room set. Background: A photograph (copyright of GOOD GOLLY MISS DOLLY) has been mounted on two pieces of A3 foam board. Each piece of foam board measures approximately 38.5 x 28.5cm or 11.25 x 15.25 in. A piece of fake grass is also included in the price below. 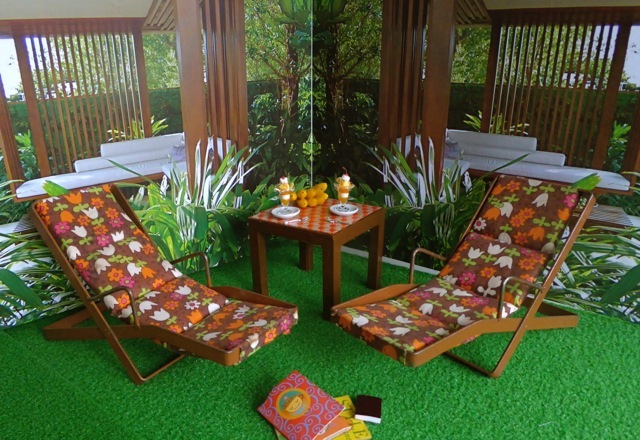 Price: for all the items in the garden set shown, excluding the dolls, £95.00. 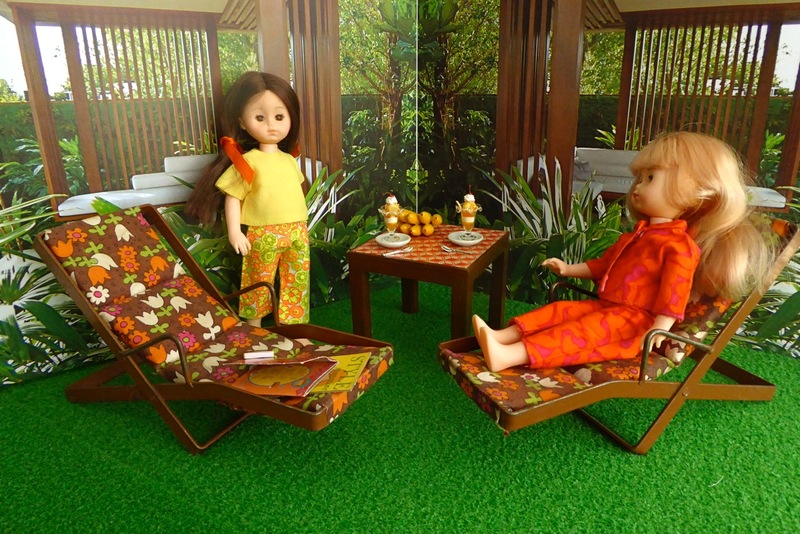 Dolls: Two vintage Lesney Ginny dolls dressed in retro prints are pictured here. They are available in the DOLLS section of this website; please contact us for details about their clothing.